A job change brought the Kerns of Our Seven Acres to Madison, Kansas. Mandy, a certified high school agriculture teacher, quickly took to growing vegetables because the county did not offer any agriculture programs. The Kerns started with field planting and chickens, then added a high tunnel, greenhouse for seeds, and have recently added a second tunnel. “If it grows in Kansas and you can eat it, we probably grow it,” says Mandy. 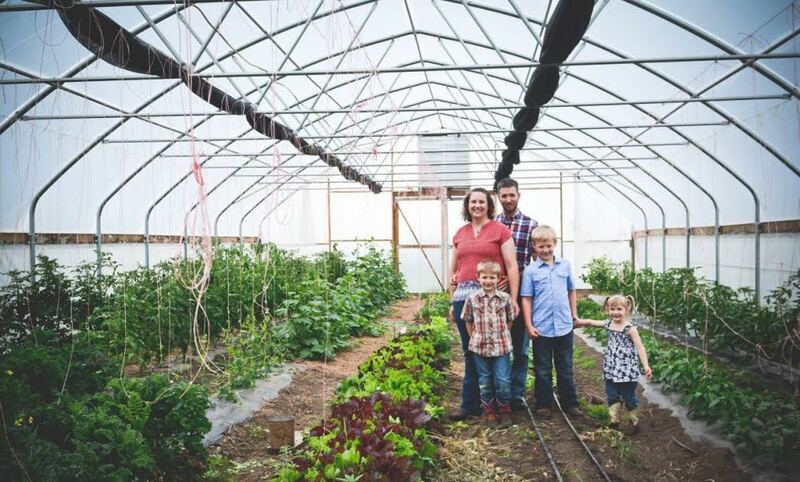 “We also offer eggs, pasture raised broilers, milk goats to make soap and our children raise goats, chickens, and calves for 4-H.” Mandy’s Kansas farming endeavors linked her up to nearby Emporia Farmers Market, where she’s been a vendor for 4 seasons and currently serves on the board. Mandy appreciates the market because it opened up several avenues and networking opportunities for Our Seven Acres. With the market there’s also local media exposure, Jessica Hopkins, the market manager who handles advertising and encouraging customers, and a festival-type atmosphere to sell and interact at. Both Mandy’s field and plate are more full these days. She has recently returned to the classroom, having started an agriculture program for Southern Lyon County schools and also sponsors the high school FFA chapter. “Growing vegetables has in turn helped me to be a better agriculture educator, as I run a business, keep records, and put into practice what I have been teaching students about plants and animals,” Mandy explains. It’s safe to say that what the Kerns have going on in Madison, Kansas extends way further than seven acres.